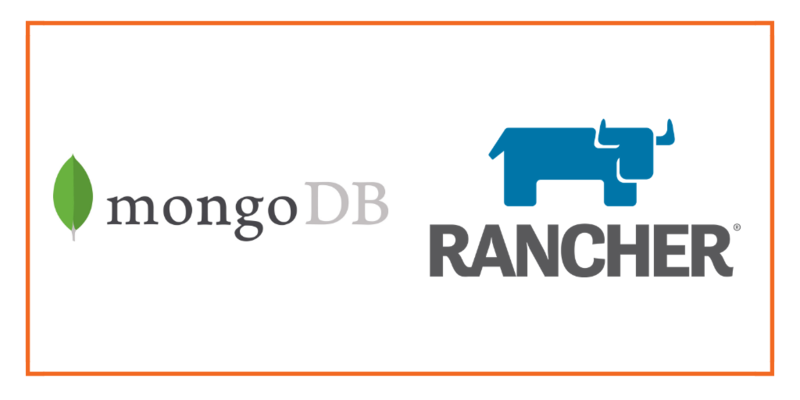 Rancher Kubernetes Engine (RKE) is a light-weight Kubernetes installer that supports installation on bare-metal and virtualized servers. RKE solves a common issue in the Kubernetes community: installation complexity. With RKE, Kubernetes installation is simplified, regardless of what operating systems and platforms you’re running. Portworx is a cloud native storage platform to run persistent workloads deployed on a variety of orchestration engines including Kubernetes. With Portworx, customers can manage the database of their choice on any infrastructure using any container scheduler. It provides a single data management layer for all stateful services, no matter where they run. 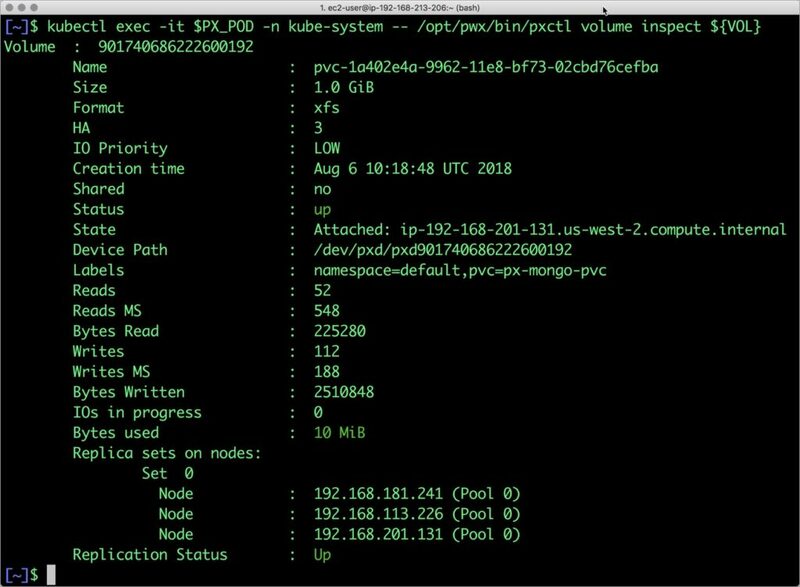 This tutorial is a walk-through of the steps involved in deploying and managing a highly available MongoDB NoSQL database on a Kubernetes cluster deployed in AWS through RKE. RKE is a tool to install and configure Kubernetes in a choice of environments including bare metal, virtual machines, and IaaS. For this tutorial, we will be launching a 3-node Kubernetes cluster in Amazon EC2. For a detailed step-by-step guide, please refer to this tutorial from The New Stack. By the end of this step, you should have a cluster with one master and three worker nodes. Installing Portworx on RKE-based Kubernetes is not different from installing it on a Kubernetes cluster setup through Kops. Portworx documentation has the steps involved in running the Portworx cluster in a Kubernetes environment deployed in AWS. The New Stack tutorial mentioned in the previous section also covers all the steps to deploy Portworx DaemonSet in Kubernetes. Once the Kubernetes cluster is up and running, and Portworx is installed and configured, we will deploy a highly available MongoDB NoSQL database. Once the Kubernetes cluster is up and running, and Portworx is installed and configured, we will deploy a highly available MongoDB database. The output from the above command confirms the creation of volumes that are backing the MongoDB database instance. After testing end-to-end failover of the database, let’s perform StorageOps for MongoDB on our Kubernetes cluster. Currently, the Portworx volume that we created at the beginning is of 1Gib size. We will now expand it to double the storage capacity. 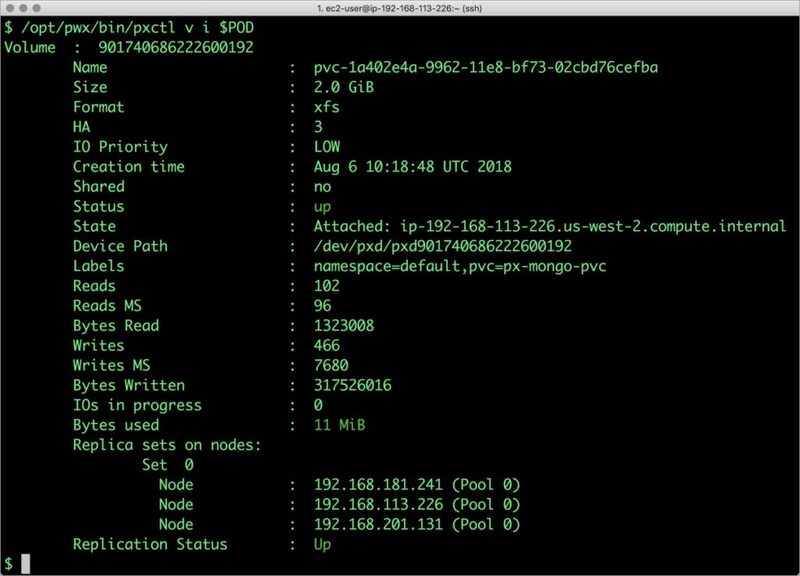 Let’s create a snapshot of the PVC we created for MongoDB. Finally, let’s access the sample data created earlier in the walk-through. Portworx can be easily deployed with RKE to run stateful workloads in productions on Kubernetes. 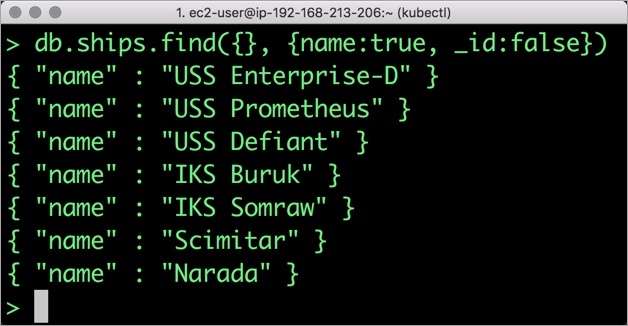 Through the integration of STORK, DevOps and StorageOps teams can seamlessly run highly available database clusters in Kubernetes. They can perform traditional operations such as volume expansion, snapshots, backup and recovery for the cloud native applications.